This month we tried something new, launching the 12 Days of Wellbeing like a little gift everyday for your inbox. We were surprised and delighted with your response! So many of you reached out to tell us this was just what you needed at the end of the year, and you’d like even more. So here they are–all 12 days, in one place in case you missed one. As a special bonus, we have made the e-mails into a beautiful, FREE e-journal with space to write and reflect (to get it, just click any of the 12 images below, and fill in the form). Here’s to a bright new year full of wellbeing! Thank you so much for 12 days of encouragement and support and great advice. Thank you for the pdf version of this series. I’m looking forward to going back through it and applying my learning. I did notice that in the .pdf version, Day 12 opening picture says “Day Eight” but has the content for Day Twelve. Thanks! Thank you for the kind words, Kathleen! Thanks for spotting that error– I believe we uploaded a new version without that mistake 🙂 Cheers! Beautifully written and illustrated. A true gift for our EQ community–thank you! Maria – this 12 days of wellbeing was an insightful journey for me thank you! Well done Maria. This was concise and well written . Thanks Maria, this is an awesome compilation! Very well done, thank you! Thank you for your kind words, Denise! I have been blown away by the response. I am very grateful to do what I do. Thank YOU! That was an exceptional, inspiring 12 day project! Looking forward to receiving the EQ newsletter! Love it. The couple riding bikes on Day 2 should have helmets and leave more room between bikes or they won’t be well long. A theme that keeps coming back to me again, and again, and again? Gratitude. Where would we be without the blessings in our life? The genuine guidance of our mentors. Our health. The ones we love. The morning cups of coffee. A place to sleep tonight. The random acts of kindness from a stranger. Who would we be without all the little (and big) gifts we take for granted? Want to read more about practicing gratitude? Fill in the form to receive a FREE copy of the 12 Days of Wellbeing e-journal with all of the content and inspiration from the original emails. Enjoy! 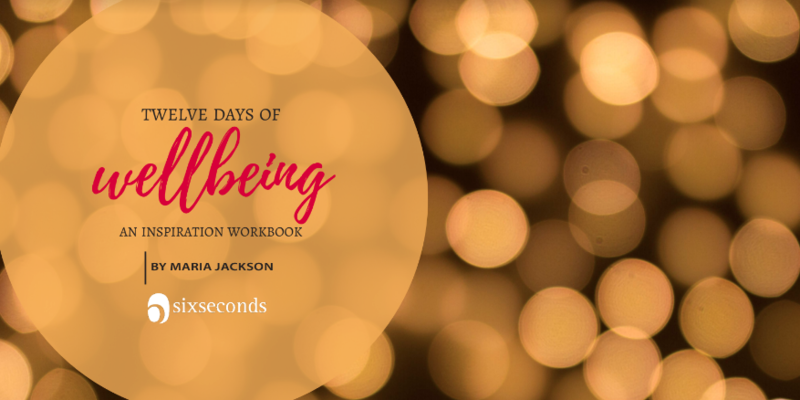 Receive your FREE copy of the 12 Days of Wellbeing e-book and journal. Empathy can be personally uncomfortable. In fact, it often is. Empathy is thought of as a way one way street: from me to you. But I actually want to connect to two different points for true empathy: from to me to you, AND from me to me. Connecting to the emotional part inside myself that mirrors the corresponding emotional part inside you is true empathy.When he is hurt, I tap into the part of myself that could be hurt. When she is angry, I tap into the part of myself that could be angry. Empathy is a practice in feeling our feelings, even when our intention is to give ease to another. Want to read more about practicing empathy? Fill in the form to receive a FREE copy of the 12 Days of Wellbeing e-journal with all of the content and inspiration from the original emails. Enjoy! Not so long ago, I learned that I am a highly self-critical person. Not so long ago, I hadn't ever even thought about what I say to myself on a daily basis. To be honest, once I paid attention, the soundtrack sounded a lot like this: "You're not doing enough; You're not meant to be happy; You will never fit in." I was living a good, intentional life, and I probably shock most of my friends and acquaintances in sharing this. I rarely showed this darkness. But deep, deep down, a very scared part of me believed these mantras to be true. Months of therapy, completing my EQPC, and practicing emotional intelligence dedicatedly has changed almost every facet of my life. I am a better communicator, a happier person, a more lovely partner, and a greater friend to myself. All of these constellations of positivity spiral tightly into one bright origin: my self-compassion. 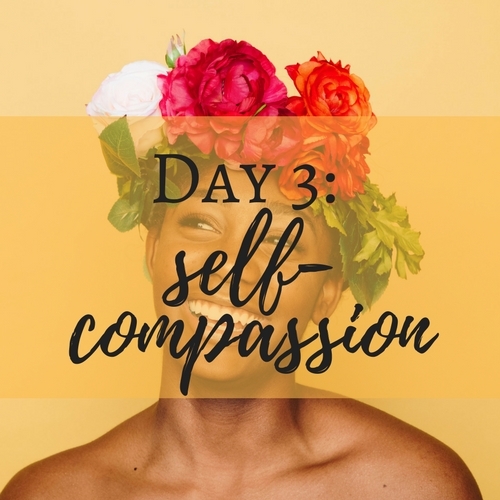 Want to read more about practicing self-compassion? Fill in the form to receive a FREE copy of the 12 Days of Wellbeing e-journal with all of the content and inspiration from the original emails. Enjoy! What does a good life look like? Lots of time with family and friends. Food on the table. A basic sense of having our needs met. Having our health. A career that we believe in and believes in us. What does an extraordinary life look like? A life deeply rooted in purpose and meaning. A life that, when left, leaves a legacy of positive change in the world. A life that is steeped in our noble goal. 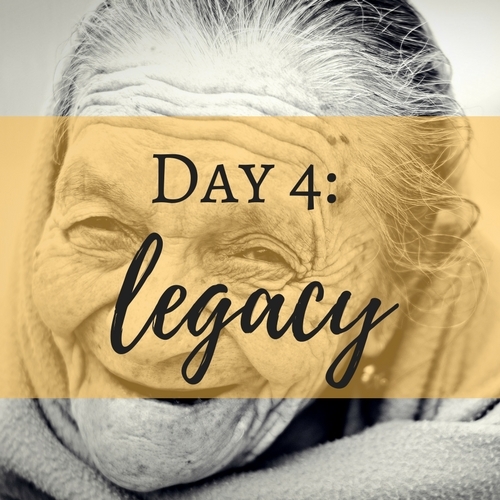 Want to read more about practicing your legacy? Fill in the form to receive a FREE copy of the 12 Days of Wellbeing e-journal with all of the content and inspiration from the original emails. Enjoy! Remember your 90-year-old self from yesterday? The one with the warm smile and all the answers? They have the luxury of having an birds-eye view of your life; they can zoom out from the details and see the whole, rosy picture. In reality, though, our life is nothing if not a composition of a million details. A million times of saying “yes” and a million times of saying “no.” How do we merge the two lives? How do we do the dishes, go to work, take care of children, and brush our teeth with our noble goal in the forefront of our mind? How do we intentionally choose a life— saying “yes” to the meaningful and “no” to the stagnant? Fortunately, a lot of wise people have gone before us to reconcile this question, and we will rely on them to teach us how to build a daily life of meaning. 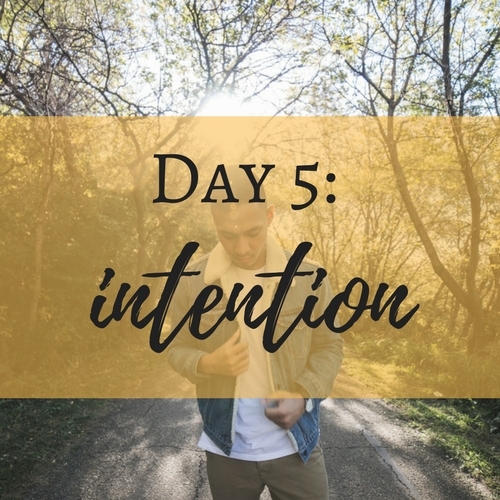 Want to read more about practicing your intentions? Fill in the form to receive a FREE copy of the 12 Days of Wellbeing e-journal with all of the content and inspiration from the original emails. Enjoy! When I was trying to find a good quote for today's topic of optimism, I found a lot of this: "the light is greater than the dark!" "look on the bright side!" and "rainy days bring rainbows!" Our culture has a lot to say about optimism, and a lot of the rhetoric seems to focus on the silver lining. This is helpful, for sure. Neuroscience has a lot to say about focusing on the positive in life; optimistic people are more likely to have healthier self-esteems, relationships, and are better leaders. However, I've actually found this "sunny-side-up" ideology to be the most useful when I am already in a good mood! 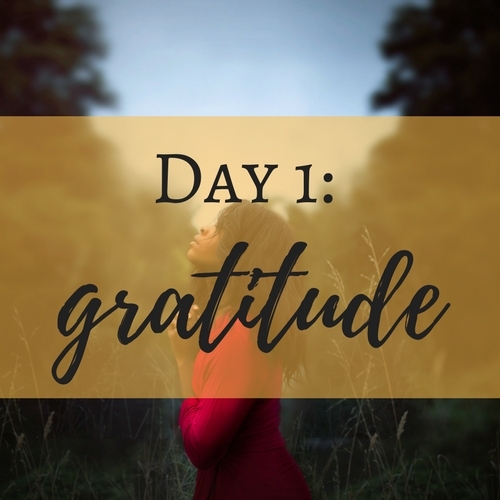 It's great to boost my attention of the great stuff going on in my life, much like we did in our first Gratitude activity of listing our blessings. But, let's admit it, most of us need help with optimism when we are on the opposite side of the spectrum. When life feels rough, when we feel stuck, when we can't seem to get out of our destructive thought patterns. What do we do then? How do we tap into a glimmer of hope? How do we even begin to envision the rainbow at the end of the rain? 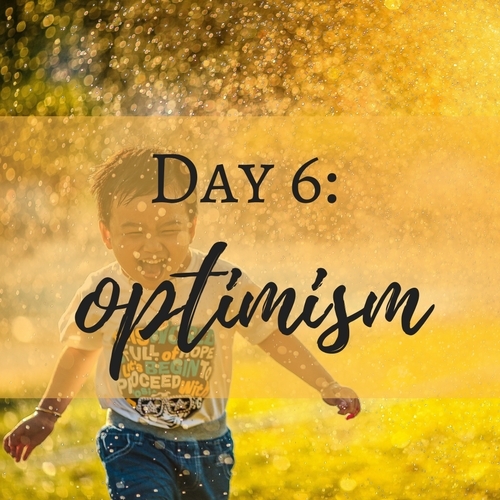 Want to read more about practicing optimism? Fill in the form to receive a FREE copy of the 12 Days of Wellbeing e-journal with all of the content and inspiration from the original emails. Enjoy! I felt tingles during most of my EQPC. There was something deep within me saying, "PLEASE listen to this. PLEASE do more of this!!" I knew I couldn't ignore the voice. I couldn't just stop this work after the training was over. 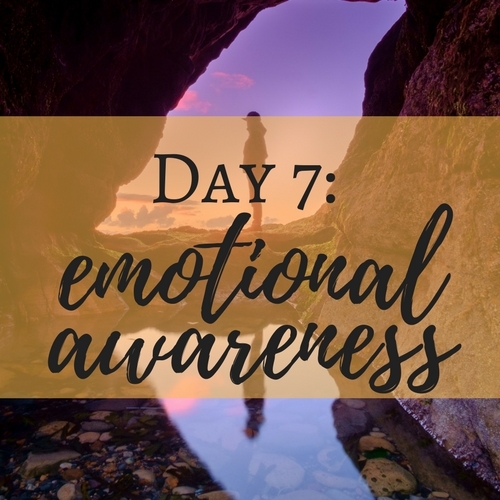 The day I got back to my cozy home, I sat down with my pages and pages of notes and drafted an emotional intelligence practice plan. I called it my "Better Self" project. For one month, I dedicated myself to a comprehensive emotional intelligence practice that unfolded itself in a million beautiful ways. Where did I start? With emotional literacy. As I had learned during my EQPC, I have a rational-focused brain style. I knew that focusing on my emotions needed to become a priority in order for my wellbeing to grow. 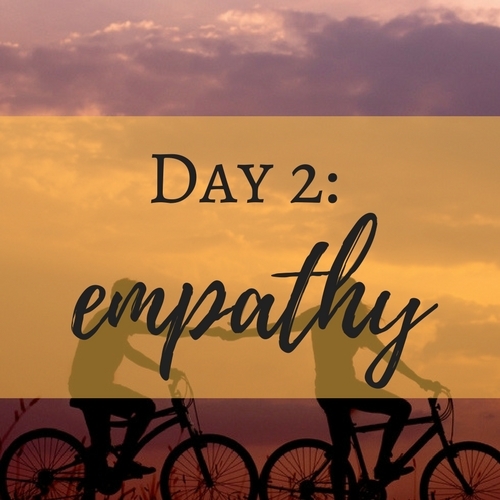 I dedicated myself to practicing the most simple tool for building emotional literacy I could possibly think of, and what I would like to invite you to do today is practice the same. Want to read more about practicing emotional awareness? Fill in the form to receive a FREE copy of the 12 Days of Wellbeing e-journal with all of the content and inspiration from the original emails. Enjoy! Yesterday was a magical day for me. I woke up in a cabin with no TV and no internet. I lazily read books beside my partner, felt the warmth of a roaring fireplace while playing games with my "in-loves", and savored a gorgeous sunset from the wide back porch with the whole family. If my day sounds like a country song, it's because it kind of was-- I could literally see a deer stand from the back porch! Seriously, though, my life felt filled to the brim with love, natural beauty, and simplicity. I felt that deepest kind of gratitude that can only come from one place-- being surrounded by people I love and who love me. 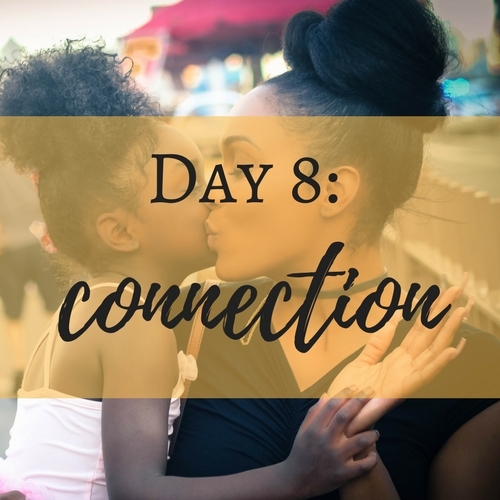 Want to read more about practicing connection? Fill in the form to receive a FREE copy of the 12 Days of Wellbeing e-journal with all of the content and inspiration from the original emails. Enjoy! It had been a hard few weeks. The logistics of my upcoming knee surgery were overwhelming me. My normally delightful relationship was going through a rough patch. My work wasn't feeling nourishing, and I was starting to doubt it all together. I was starting to doubt myself all together. I had lost the trust in myself that I hold so dearly. I was becoming engulfed by the unsettling waves of my life. And before it got better, it got a lot worse. 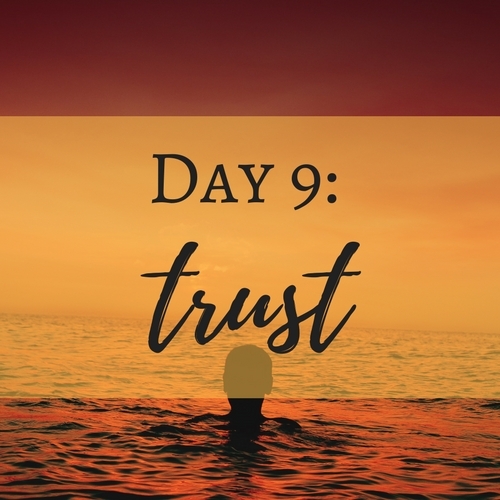 Want to read more about practicing trust? Fill in the form to receive a FREE copy of the 12 Days of Wellbeing e-journal with all of the content and inspiration from the original emails. Enjoy! Occasionally, we have days like the one I described yesterday. Challenging. Packed with opportunity for growth. Exhausting. Occasionally, we have days like my day at the cabin. Glorious. Cup-filling. Restful. And all the other days? This is where our focus is going today. 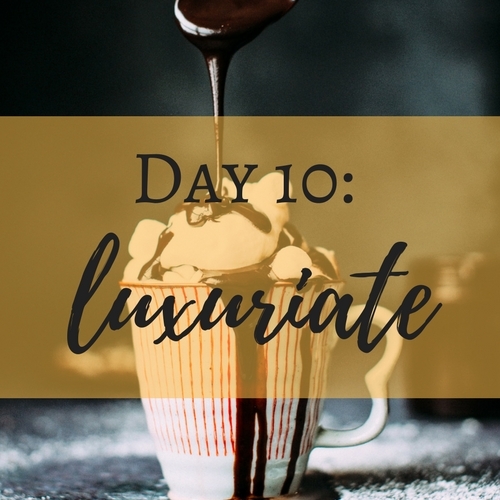 How can we pour a little hot fudge on the most mundane of days? Want to read more about luxuriating your life? Fill in the form to receive a FREE copy of the 12 Days of Wellbeing e-journal with all of the content and inspiration from the original emails. Enjoy! I have to be courageous in admitting this, but I am not particularly courageous. Sure, I have moved to non-English speaking countries, jumped off frighteningly-tall waterfalls, and quit jobs that didn't serve me without ones to replace them. But I hate conflict. I hate making people uncomfortable. I hate feeling judged by others. I will happily perform an improv breakdance routine in front of hundreds, but I will not confront someone about not doing their dishes. Barring the few of you who have done significant work to overcome your fears, I suspect I am not alone in having an achilles heel of fear. I also suspect I am not the only one who could benefit greatly from sucking in a breath of courage and jumping into the waters of my discomfort. 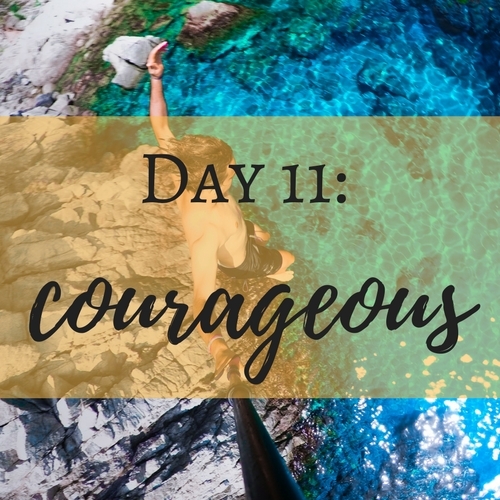 Want to read more about practicing courage? Fill in the form to receive a FREE copy of the 12 Days of Wellbeing e-journal with all of the content and inspiration from the original emails. Enjoy! I could have so easily slipped back into the person I was. After my EQPC, I could have so easily trudged along on my well-trodden path of negative self-talk, comfortably destructive overanalyzing, and well-worn pessimistic beliefs about myself. Honestly, regressing to habits is the most natural thing for a brain to do. Habits are automatic and thus take less of the brain's precious energy. Breaking bad habits, then, takes some dedicated work. Like lighting a match, we must create friction to transform darkness into light. I have been lighting that match every single day, in a hundred different ways, since my EQPC. And, guess what? It's becoming easier. My old, destructive habits are still in my brain, but their grooves are becoming shallower as my healthy, new habits are becoming deeper. 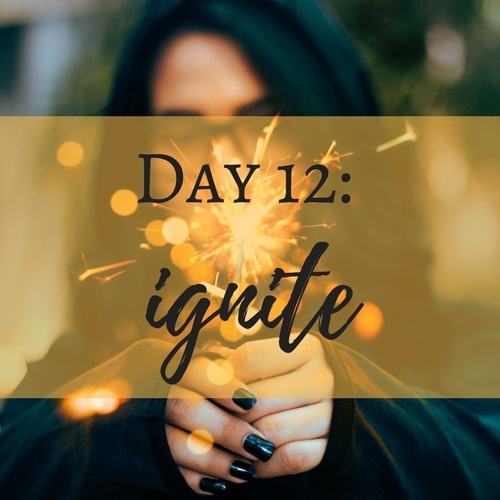 The friction that I created in those first weeks to ignite those new, healthy habits have lent their warmth to other, healthy habits that have ignited since. What has caused this phenomenal change inside myself, and why didn't I regress to my old, unhealthy patterns? I made an immediate plan. Want to read more about igniting your practice? Fill in the form to receive a FREE copy of the 12 Days of Wellbeing e-journal with all of the content and inspiration from the original emails. Enjoy!